This I Believe is the theme of the University of Maine at Presque Isle’s 17th annual University Day, taking place on Wednesday, April 11, and students will be showcasing that theme in presentations on everything from service learning in Tanzania to mental wellness to education for underserved students. 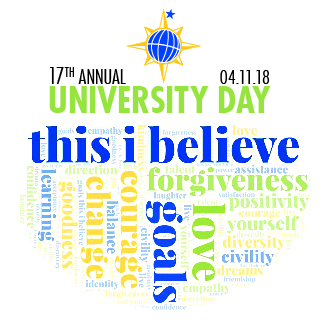 University Day is an event that heightens awareness of the academic research, scholarly work, and community service being done by students in all of the disciplines represented on campus. The annual campus event allows attendees, especially students, to better understand how disciplines interrelate and how the academic work being done applies to the local and global community. It is also an opportunity for students to experience a professional conference format, many for the first time. No regular classes are held during University Day, but in their stead, students are encouraged to attend student-led presentations and talks held during five sessions throughout the day. 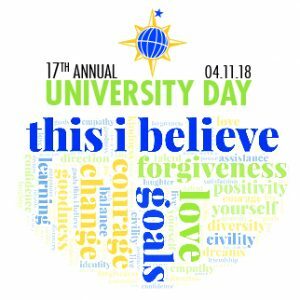 University Day officially kicks off on Tuesday, April 10 in the Campus Center, with a poster session from 5-6:30 p.m., followed by a Distinguished Lecturer Series presentation by Hilary Corna, author and founder of the #DareYourself Movement, at 7 p.m. The poster session will feature more than 20 posters on research done by students in environmental science, geology, biology, ecology, genetics, geographic information systems, social work, and psychology. Students will be present to discuss their posters and answer questions. Beverages and dessert will be served. Immediately following the poster session, Hilary Corna will serve as the next speaker in UMPI’s 2017-2018 Distinguished Lecturer Series, delivering the University Day keynote address. Corna is a former senior executive with Toyota in Asia and has published a memoir, One White Face, about her time abroad. Since its release, it has been featured in such media as The New York Times and NBC, and is now being adapted into a screenplay. During her talk, titled #DareYourself: The Art of Global Leadership, Corna will discuss how audience members can develop a mindset of daring themselves so they can be the leaders they’re meant to be. Her mission is to cultivate a daring community of leaders prepared for the 21st century. Her talk is free and open to the public. The next day, more than 100 students will present talks, demonstrations, and presentations, covering areas of study as wide ranging as accounting, art, athletic training, biology, criminal justice, education, English, environmental science, history, psychology, professional communication, and social work. During lunch, from 11:30 a.m. to 1 p.m., UMPI student clubs and organizations will have displays set up in Wieden Gym to showcase each group and its efforts. To add to the community spirit of University Day, UMPI is welcoming the public for the Tuesday evening activities and the entire day-long event Wednesday. The University Day committee has invited students from local high schools, and community members are welcome to attend all sessions. As in past years, University Day offerings will include an online “proceedings” of the event, which features in-depth abstracts for each presentation. The proceedings, scheduled to be published a few days before the event, will be able to be viewed at www.umpi.edu/uday/proceedings. A schedule of University Day activities can be found at www.umpi.edu/uday. For more information about University Day 2018, please call 207-768-9452 or email umpi@maine.edu.